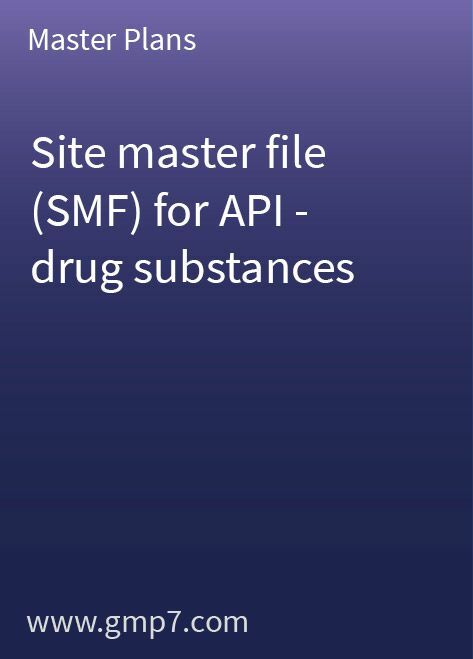 The active pharmaceutical ingredient (API) SITE MASTER FILE (SMF) provides a general overview of the site and its operations. A SITE MASTER FILE is prepared by the manufacturer and contains specific and factual GMP information about the production and/or control of API manufacturing operations at the named site and any closely integrated operations in adjacent and nearby buildings. On 5 November 2002, the guidelines for the preparation of a SITE MASTER FILE (first edition, April 2000) were replaced by the PIC/S explanatory notes for industry on the preparation of a site master file, 1 November 2002. The 29-page SITE MASTER FILE template only needs a small amount of site-specific modification before it can be adopted in its entirety for your operations. All you need to do is enter your site-specific information in the coloured fields that are marked.